The below chart tracks the proportion of the different sectors of the US stock market over the past 218 years. 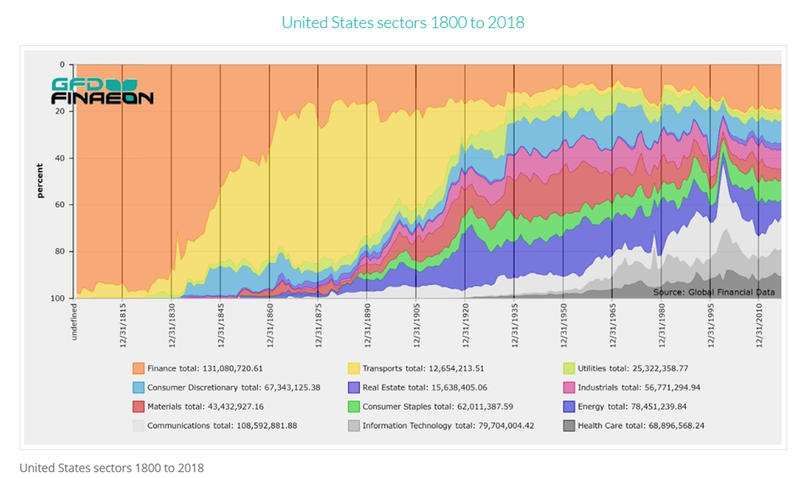 While there are a lot of insights contained in this, the one that sticks out is the fact that Transports – the yellow section of the chart – had virtually no weight among the market sectors in 1815. About 50 years later, in the late 19th century, Transports made up over half of what was known as the general market index. New-fangled steam-driven locomotives were the mainstay of the boom. As an industry the railroads came from nothing, then took off following the opening of the Baltimore and Ohio Railroad in 1830. The railways opened up the country, powering the Industrial Revolution the same way as they had in the United Kingdom. But – as is always the way - speculators entered the fray, looking for quick wins, building new track mileage in order to build fortunes. Transports became the overwhelming element of the US market, even surviving the Civil War. The 1873 financial crisis saw the zenith for the railways. Firstly, the subsequent depression did much to kill off the financial speculation, then in the early 20th century motor cars and trucks took away some of the railways’ passenger and freight business. By 1920 Transports was still a sizeable 20% of the market; by 1935 it was negligible. Contrast that to Communications and Information Technology more recently. They have gone from virtually nothing in 1950 to a significant part of today’s market. It seems like a long time – it is – but in our investing lifetime, major sectors will rise and fall, to be replaced by sectors that may not even yet exist. The re-weightings are quite significant in that ‘Telecoms’ has become ‘Communications Services’ and gone from a weighting of 2.0% to 9.9%, while ‘Technology’ has moved from 25.9% to 20.8% (as an aside, railways are lumped in with roads, being one of five industries in the ‘Industrials’ sector which has a total weighting of 9.7%. As another aside, Finance’s proportion has remained relatively constant since 1875). This significant change around tech may be a matter of moving around the deck chairs in the media/ internet/ e-commerce sector, but such a change indicates how slow indices can be to reflect the real investing universe. MSCI/ S&P Dow Jones Indices are usually quite slow when changing the artificial constructs that are indices. By its nature they reflect what has happened yesterday, weighting sectors higher that have increased their relative market cap in the past, rather than what may increase their market cap in the future. 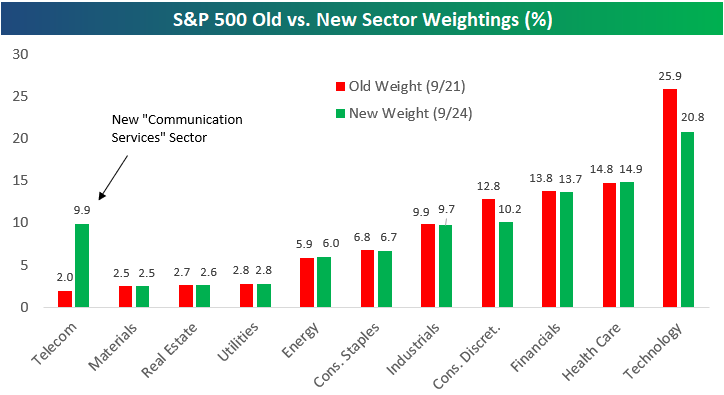 The MSCI’s increasing of the weighting of a particular sector may not be the ringing of the bell that that sector has reached a top, but it’s a fair signal that prices have risen in the sector and/or new entrants have been enticed into the market by higher multiples (FAANG stocks corrected significantly in the quarter ended December 2018). Therefore, if you are investing on the basis of these indices then you are not going to be in the front of trends, but permanently behind. Just as an example, any index fund that invested in railroads in 1875 would have seen a significant retraction in their value in relative terms over most of the next 60 years, while those looking forward to Materials would have been looking far stronger as that sector’s proportion of the market rose. In an environment where annual equity returns are likely to be ~5%, this will obviously have long term ramifications for returns. In contrast, active managers like us are attempting to see something before others do – looking for the cheaper up and comer rather than the expensive established sector. The question is are you going to be in front of trends, or favour lagging market sectors and expensive stocks?